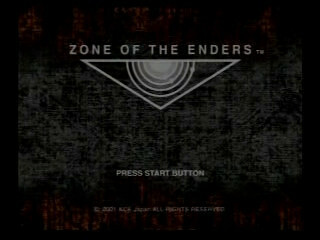 Packaged alongside the Metal Gear Solid 2 demo, the crazy-fast mecha game Zone of the Enders was released worldwide in March 2001. ZoE puts you in the role of Leo Stenbuck, a young boy who is forced to pilot the Orbital Frame Jehuty through the war-torn Jupiter colony of Antilia, and deliver it to a civilian transport vessel. Best time: Single-segment 0:32:32 by 'Festival-Temple' on 2013-07-16. Neith 1: Hitting her with a charge shot and one slash is all that's needed to make her run away, but the timing on it is specific. Shooting too early makes her dodge, but shooting too late makes her interrupt with attacks. Factory 1 (first): After taking out the two enemies behind, I can't rush straight for the console because others are in the way. I take a roundabout route to avoid them. There are cases of this all over the game where going directly toward an objective is a bad decision. Tempest: This is very straightforward. Three charge shots, dodge an attack, then another charge shot to end it. Factory 1 (second): This is one of the places where we see linchpin enemies. One of the three enemies here has an asterisk next to its number. The asterisk means killing that one will cripple all other enemies in the group, making them lvl1 with almost no health. Only one other linchpin group is seen in this category. Town 2 (first): Here I need to break all porters to get the sniper rifle needed in City 1. You can only pick up items when outside of battle, and "escaping" from battle involves manipulating the camera such that there are no enemies on your screen for three seconds. Ignoring all enemies and going for an escape right on top of the item is possible but very risky thanks to a group of two lvl3 raptors along the way, so I go ahead and take those out. City 1: Out of the 20 sniper shots I have, 8 need to be used here and 11 need to be used in Factory 2 (first). Missing one shot would be okay, but missing two would mean having to get more ammo in Town 2 (second). EPS 2 (first): I trigger a cutscene, then kill the three cyclopses it spawns. I use my first charge shot without targeting because they can't dodge if not being targeted. Town 1: There are three mummies that need to be killed here, so I make use of the same trick as before. They only defend against charged shots if being targeted directly, so I continually switch targets just before shooting to get successful attacks in. EPS 1: This is very straightforward. The generator can be killed in a single laser volley. Town 2 (second): This was the biggest gamble of the run. I had to escape in a place surrounded by enemies on all sides so I could pick up the raptor body. If the enemies' RNG decides to not leave me alone, the run ends here. EPS 2 (second): Straightforward. I kill the raptor body I just used. Factory 2 (first): I go ahead and snipe the porters for decoy now, but it could also be done on the second trip. City 2: Straightforward. Kill both enemies for the passcode. It helps to lure them back between buildings, giving them less room to run and making it less likely reinforcements will enter the battle. Town 3: The group of three that come in from the west have the passcode, but it's necessary to kill another group first to spawn them. Factory 2 (second): I get the driver for the decoy program and leave. A group of enemies randomly decide to spot me so I spend four seconds escaping from battle before I can leave the area. Tyrant: I use a decoy when targeted and charge shots when not. For the second phase, I dodge three of his rushes, use two charge shots, then take out the remaining health with the basic gun. Mountain: This portion includes the only other group of linchpin enemies seen in any%. I take out the lvl6 mummy first so the others in the group can be one-hit-killed. Nebula: A charge attack can be snuck in through his first phase's hexagonal lasers to finish things a little earlier, but whether it gets through is up to chance. In the second phase I have to interrupt its attack animations right as they begin so that his shots don't come. Shooting too early or late causes the shots to either do no damage or miss, and Nebula's attacks will still come through. Neith 2: This and Zombie Neith are the two hardest bosses by a large margin. Being too close is very dangerous thanks to their unblockable melee charge-attacks, so I play this safe by hanging back with the basic gun and using charge shots when possible. Bombs: It's possible to play this much riskier and save something like twenty seconds of scanning by simply ignoring enemies and disarming bombs as fast as possible--using the three remaining decoys from the Tyrant fight to distract them. If they aren't distracted by the decoys for long enough, they'll attack while I'm disarming the bomb and instantly kill me. Zombie Neith: I'd assumed the Story mode fight against her was just like fighting against a max-leveled opponent in Versus mode, but her behavior was very different. I had gotten used to a strategy of continually throwing her into a wall when she charges her fireballs, but that wasn't reliable here so I lost a lot of time.